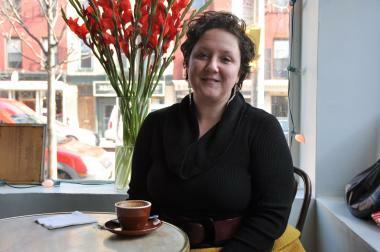 Julia Fierro, 36, will publish her first novel, with St. Martin's Press in Spring 2014. COBBLE HILL— Welcome to the complex world of modern parenting. Local Cobble Hill writer Julia Fierro will publish her first book in spring 2014, a work of fiction told from the perspectives of five Cobble Hill moms, a stay-at-home dad and a Tibetan nanny. The book, published by St. Martin’s Press, also reflects the wealth of these families, and the pressures they often face to maintain a certain lifestyle. Several of the book’s smaller narratives are taken from the author’s own life, such as the story of a mother coping with a son who is a special needs student. “It’s the hardest job there is,” said Fierro, who has two children, ages 5 and 3. Since moving to the neighborhood in 2002, Fierro has moved from Sackett Street to Union Street, and now resides on President. She also founded the Sackett Street Writers’ Workshop that started as a small group of Brooklyn writers and has grown to include workshops in fiction, non-fiction, and poetry writing, among others. The book explores experiences of contemporary parents, like the stay-at-home dad whose son wants to wear a princess dress or the mother who steals money from a pre-school for in-vitro fertilization. But a main theme of the book, said Fierro, is the overwhelming amount of information that parents have to absorb. The book begins with a mother pushing her daughter on a swing in Carroll Park. When she hears a kid next to her daughter coughing, she grows afraid and insecure that something could happen to her own child. Fierro has faced this kind of insecurity, she said, when she was pregnant with her second child during the swine flu epidemic. She would often visit “mommy message board” where there was an avalanche of frightening information about parenting. “I think it’s easy to be really hard on yourself,” said Fierro, adding that ambitious and educated mothers often expect a lot from themselves. In some ways, the books is a commentary on contemporary parenthood, said Fierro, one that some might view as “controversial.” She said she “wanted to expose her own insecurities as a mother,” something that not every parent would be willing to focus on.